Here are some of our favorite ads that have stood the test of time. The more things change, the more they stay the same. 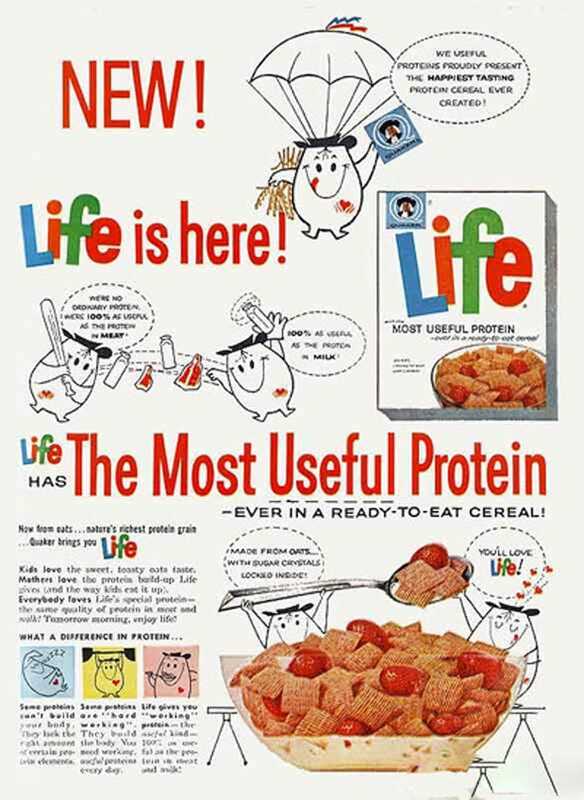 The healthy message of this Life Cereal ad from 1962 could apply right now. If only they had buzzwords like "organic" and "artisan" back then. “It’s the fun food kids love best, and the feeling is mutual!” Wait, beefaroni has feelings and emotions?! This changes everything. The last 50 years has changed society in just about every way imaginable. One thing that hasn't changed one iota? Bananas and cereal are still together like, well, bananas and cereal. This two-page spread shows off the many uses of Heinz products as ad men of the 1960s saw it. If this ad were to run today, there would probably be a burger hanging out with the ketchup, however. Of course, nowadays we know that processing and heating polyunsaturated fats can eradicate their much vaunted health benefits. So this lady’s husband probably died mere minutes after shooting this photo. Oh well. At least she tried! If you are looking for proof that we eat more than we used to, look no further than this Burger King ad. The Whopper used to be a meal in itself. Now it’s only a meal with a large fry fries and a cola. This is a great ad that would not be out of place in today's marketing climate. Caviar as a wig?! Now that’s something Don Draper probably wished he had thought of. His superman locks won’t last forever. Hopefully Mad Men will enlighten us as to why ad men thought that showing a shake atop a mound of unidentifiable powder or raw meat being ground beside a burger were clever marketing ideas. Hash is about as old as breakfast itself. However, inexplicably stuffing it into a hollowed-out orange seems like it could have only have happened in the 1960s. Using mustard as a key ingredient in pot roast also seems like a relic from the ’60s, but it could be weirder. : The whole roast could be stuffed into a hollowed-out orange. It seems Special K has not changed their marketing strategy since its inception. It’s interesting to notice that they used to market more towards men, whereas now it is the opposite.